Digital cameras have made photography so easy that we sometimes forget that things can still go pear-shaped if we’re not treating our equipment carefully. In today’s guest post from Kim Olson, we learn how to properly care for our memory cards so that we don’t have to face the pit-in-the-stomach feeling of losing all our photos. Card Error! Those are two words you never want to see on your camera. And when you do, you’ll probably feel a bit of panic. Like it or not, memory cards do fail and there’s a decent chance you’ll encounter a card error now and again. The good news is there are quite a few things you can do to help make sure it doesn’t happen often. Simply erasing, or deleting, images on your memory cards doesn’t fully clear the cards of leftover data. Instead, it’s better to get in the habit of formatting your cards. Formatting is a more complete way of clearing old files from your card and can reduce the risk of data corruption. A word of caution, though. Formatting is typically irreversible, so always be sure all of your images are backed up before doing this. Without getting into the technical details, the general consensus is that you should always format your memory card in your camera and not on your computer. If you use your computer to format your cards, there’s a chance your camera may not be able to read the file structure properly. When you buy a new memory card, it’s always good to reformat in your camera before using it. This ensures the card is ready for that particular camera. While you could encounter some issues using the same memory card in different cameras, it’s normally not a problem so long as you format the card in the new camera before using it. From what I’ve read, if you delete a single image or multiple images in your camera as you’re out shooting, there’s a higher likelihood that you may have issues with data corruption. You’re much better off waiting to delete images once you’ve downloaded them to your computer. Memory card prices have come down considerably in the last few years and in general, it doesn’t cost a lot more to get name-brand cards. When your memories are at stake, it’s a good idea to stick with brands that are trusted and recommended. They’re more reliable and tend to have fewer problems. Just because they make gigantic memory cards (32gb is crazy big), doesn’t mean you have to use them. And in fact I don’t recommend it. Let’s say you go on an amazing safari and you brought along just one 16gb card. Sure, that card will fit most, if not all, of your images on it. But what happens if that card fails? What if you lose it? Everything’s gone. In general, it’s a good idea to have at least 2-3 cards, and I typically recommend either 4gb or 8gb cards depending on how large your images are. I shoot in RAW mainly so I tend to prefer 8gb cards. Always be aware of how many images you have left on your memory card so that you don’t go over that number. If you do, the card may have trouble trying to write the data to the card since the card is already full. If you’re downloading images or if you just finished shooting a bunch of images in burst mode, be sure to let the camera finish its task of writing to the card or reading from it before you turn it off or remove the card. Always turn off your camera before you change memory cards. And I mentioned above, be sure to wait until it has finished writing all the data to the card. If you ever have any problems with a memory card, throw it away once you’ve downloaded the images from it. It’s much better to just get rid of it rather than risk the chance of it failing on you in the future. I was really surprised to learn that some people use their memory cards just one time, and then when it’s full, keep it as a backup of their images. There’s a much better way. First of all, memory cards are meant to be reused. And secondly, they’re not ideal for long-term storage. The best thing is to have at least two copies of all of your images, and I think a combination of hard-drive and online backups is ideal for most people. Whether you’re on a Mac or a PC, there’s a proper way to eject, or safely remove, your card from your computer. This ensures you aren’t unplugging your card while any data is being accessed and helps prevent any corruption from occurring. When downloading your images from your memory card to your computer, do a “copy” instead of a “move.” This ensures that if, during this transfer, any weird interruption occurs (like a power outage or your camera battery dies), you’ll still be able to access the images later. If you connect your camera directly to your computer to download your images, be sure you have enough juice in your camera’s battery to fully complete the download. You wouldn’t want your camera to die mid-transfer. There are never any guarantees that you’ll never encounter a corrupted image, but if you follow these guidelines, you’re far less likely to have any problems with your images. Kim Olson is a travel writer + photographer at KimOlsonPhoto.com where she writes about traveling, simple living and finding creative ways to spend time on the things that matter most. You can also find Kim on Facebook or Twitter. It’s also worth noting, for compact flash cards, there is a write limit. So if you’re still using that same 4GB card from five years ago, because it cost so much then. Then be ready for a failure soon. 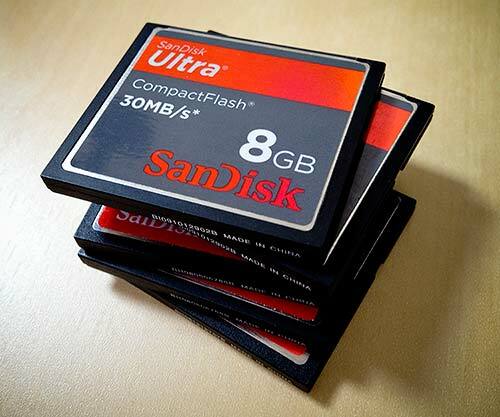 Update your CF cards every couple of years – this is dependent on usage of course. Thanks for the tip, wolfkabal! I do have quite a few cards in rotation, so hopefully I’m spreading out the usage a bit. But I should probably update a few of my cards soon. Thanks for the tips! Especially the one about opting for smaller card capacities. It’s not one that might usually cross someone’s mind while buying cards!